Cotton Textile History--printing, dyeing, manufacturing and trading. Because we are having a spring like day here, I find myself attracted to light, delicate designs. Tissus legers-sheer fabrics. 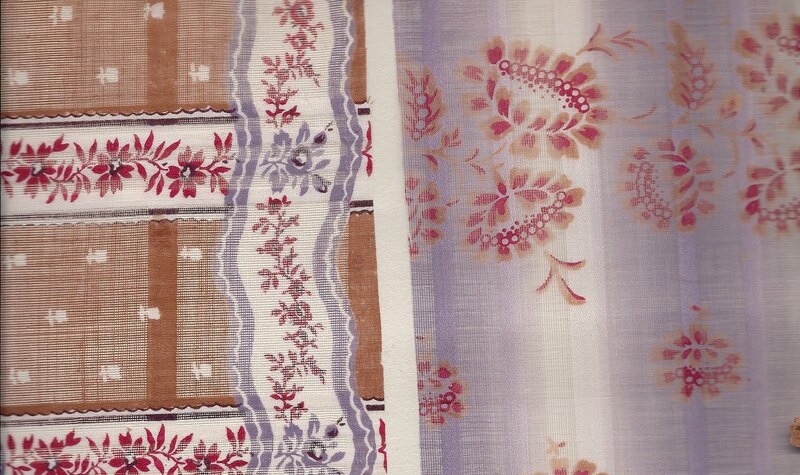 These are from a sample book from Mulhouse dated 1843. 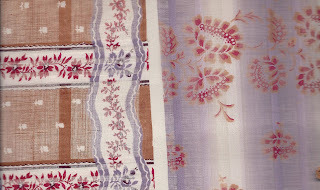 These fabrics are net like and were printed by Depouilly. was a very fine French woolen dress goods fabric. In 1836, Jose Hofer of Mulhouse began weaving a fabric with a strong cotton warp and fine wool for the weft with a weight and hand similar to the 100% wool fabric. It was possible to print vibrant designs on this combination fabric using the steam style of printing. 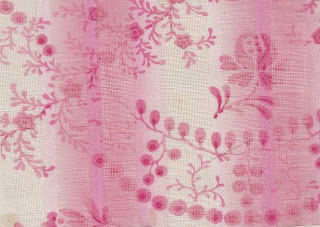 Delaines, as the fabrics were called in England and America, were especially popular for both clothing and decorating and are frequently found in woolen Log Cabin/Pineapple quilts of the late 19th century. These are two images from one of my 19th century sample books. Both are wonderful Prussian blues prints. The title of the book is 'Delaines 1849'. I have reproduced these delaines on cotton with authenic scale and coloration. Inorganic mineral colorants were introduced in the 1790s—iron buff, antimony orange, Prussian blue and manganese brown. It took a number of years for these new colors to be used in textile dyes. One of the most popular was the Prussian blue, often in combinations with 'dunn'--a drab tan. Two examples of the mineraly Prussian blue. Especially popular in American quilts, 1830-1860. Patterns for cotton prints which featured stylized floral motifs with stems bent at oblique angles were often referred to as Batons rompus ( fr. Broken sticks). The style first appeared around 1790 and was popular for several decades at Jouy and Mulhouse in France. The first two examples are from old out of print Dargate lines. These are current designs. The first is from the Dargate book ( c. 1830 Mulhouse) and the second from Marcus Brothers.